I really liked these. They were so easy to make too, especially after last week’s many-stepped eclairs! Lovely photo. This was so easy & a hit with all, for sure. It really was easy, wasn’t it? Yours turned out beautifully, too. Oh yeah…this is my kind of entree. What? 3 steps. I love delicious and QUICK recipes. Thanks for sharing! Ciao ! You are perfectly right ! Yours are dead beautiful too ! Your batons look so yummy and golden! Gorgeous…I need to get to these soon. Maybe I should do them right now they look so good! Thanks for visiting me:) and yours look beautiful. After looking at several other posts, I can see your pictures are always great. Good job! Wow that sounds so good and simple! I love appetizers like that. Those look delicious. Thanks for the easy go-to appetizer! 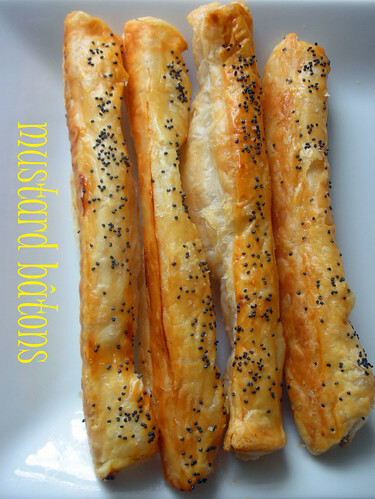 IF i could have found puff pastry I would have made these. And if I had time to make puff pastry I would have made these. Yours make me wish I HAD made these.